Best connectivity even for the most demanding of users and applications. Wherever there is high-density Fixed LTE coverage, you will have a distinct advantage over a wired network. Quick and easy to install. Simply plug and play. Check out if you have Fixed LTE coverage and buy online by using our new feasibility tool below. Billing rates are kept consistent due to it being hard capped. The unit is as easy to install. Simply, plug and play. The Fixed LTE router is mobile and easily transportable for use anywhere in the Rain Fixed LTE coverage area. Short for Fixed LTE-Advanced or, Long Term Evolution-Advanced: This is a network on which you can experience true 4G speeds, anything up to 50 mbps on our indoor unit. 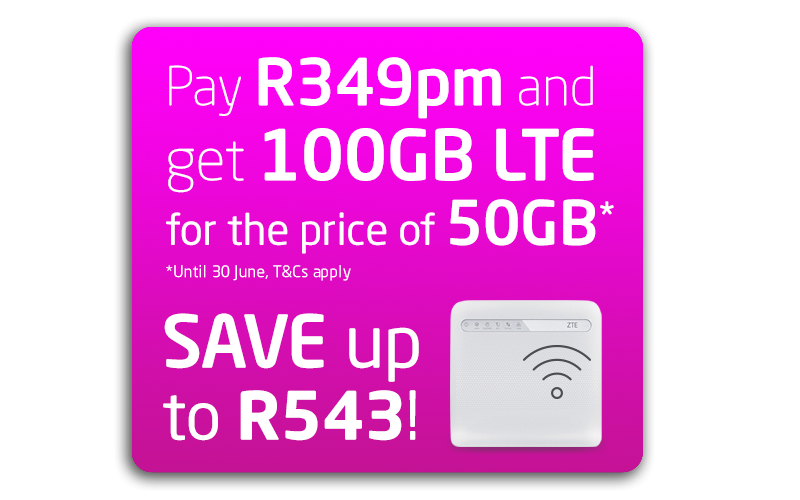 Are there uncapped data packages available? All packages are hard capped. Data usage can be viewed on the customer zone. What Fixed LTE approved hardware can I use with my Cell-C LTE SIM? Does Vox apply pro-rata data allocation in month 1? Vox pro – rates the first month’s data allocation and billing according to the date on which the order is activated. Can I top-up my data if I run out? Yes, the following top-ups are available for Cell-C customers to purchase via our customer zone. No, your monthly allocated data will expire at 23:59 on the last day of the month. You can view your usage by logging into the customer zone. Are Fixed LTE Speeds guaranteed? Fixed LTE is a best effort service, meaning you will receive speeds based on the capacity of the network. During busy periods the network speeds will be reduced. Please visit the feasibility tool to place your order.